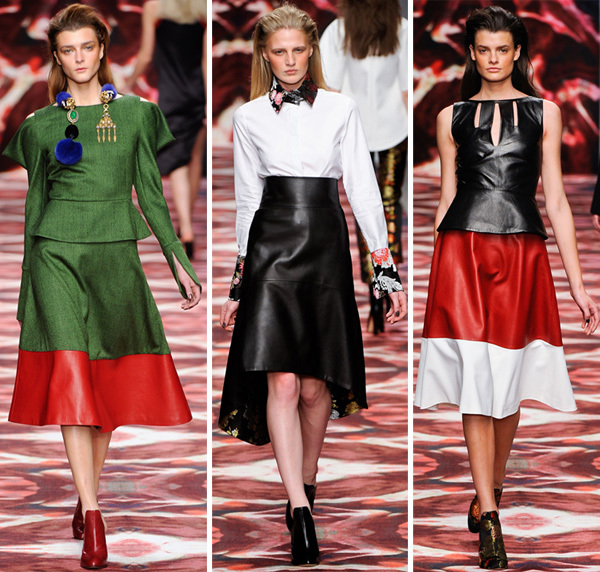 One of this fall’s must-haves is a leather skirt. Black or bordeaux, full or pencil, short or long, a good leather skirt is a great fashion item for the cold season. It can be worn with various tops as well as go well with a blazer. 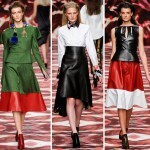 The leather skirts can be found at such brands like Lanvin, Osman, McQ, Sachin+Babi, DKNY and others the more budget variants are offered by Alice + Olivia, ASOS, Vero Moda, Kookai, Urban Code and many others. Oversize sweater is a great contrast to the streamlined pencil skirt in smooth leather. A cropped sweater can also look great with such a skirt. A full leather skirt will go well with a thin woolen long-sleeved top/sweater while the short skirt can be toned down in a combination with thick black tights. To make your legs look longer opt for black boots. There aren’t only smooth leather skirts out there. You can also find croc textured, layered and studded designs some featuring edgy slits and others even assymetic hemlines that were so trendy this summer.